The discovery of footprints dating from 365 million years ago on Valentia Island gives an indication of the vast extent of Kerry´s natural history. At that time Kerry, and Ireland was basking in sub-tropical seas south of the Equator. The trail of the tetrapod and Kerry have come a long way since then. Today Kerry is situated in the Northern Hemisphere. Although we miss the sub-tropical seas we are fortunate to that our coastline is washed by the warm waters of the Gulf Steam which comes all the way from the Gulf of Mexico. 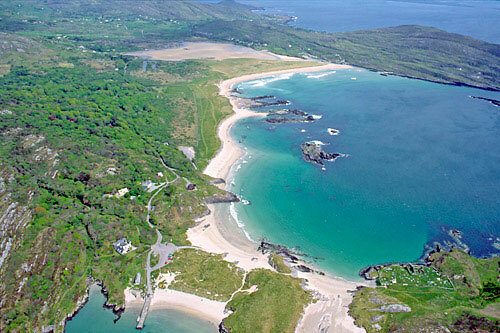 Apart from the fact that it is possible to swim in the sea here all the year around, the effects of the Gulf Stream have made this corner of Ireland a delight for naturalists. Plants such as Arbutus (Arbutus unedo), Rhododendron (Rhodoendron ponticum) and fuchsia (Fuchsia magellacina) are native to warmer climates such as the Mediterranean and South America but thrive quite happily on the road-ways and hill sides of Kerry. But it´s not just our climate which makes Kerry interesting. We also differ from the rest of Ireland in our wide variety of interesting habitats. Fourteen of Ireland´s highest mountains are in Kerry, the highest being Corrán Tuathail (1039m / 3134 ft). The oakwoods at Derrycunnihy and Tomies are the last of Ireland´s primeval forests. At Muckross one can see one of three yew woodlands that remain in Europe. The islands off the coast are summer homes to huge numbers of sea birds. The Little Skelligs island with its 66,000 gannets is the world’s second biggest colony of these beautiful birds. Although the giant Irish Elk is long gone, the magnificent Irish red deer and the introduced Japanese Sika deer still roam freely in the mountains above Killarney. This marvellous variety of habitats is all the more interesting, as they have evolved over millions of years. Our little county, along with the rest of Ireland, has been baked by desert sun, submerged under tropical seas, subjected to massive volcanic eruptions and encased in ice. As the glacier finally moved off to the sea the jewel of the Emerald Isle emerged, the Kingdom of Kerry. There is much to interest the naturalist and lovers of the outdoors.